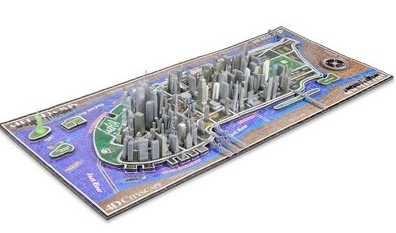 This puzzle recreates Manhattan’s famous skyline not only in three dimensions using scale-model buildings, but also along the axis of time, spanning 101 years of its architectural history. The puzzle includes 113 plastic buildings that depict the city as it appeared as far back as 1812 through to 1973 with the addition of the World Trade Towers, and into the future in 2013 with the completion of Freedom Tower. The only things missing are a life size King Kong and 40,000 cabs.